This story originally appeared in the Breakthroughs Newsletter. Lung diseases studied by investigators in the Division of Pulmonary and Critical Care Medicine target airways (center), vasculature (lower left) and alveoli (surrounding). 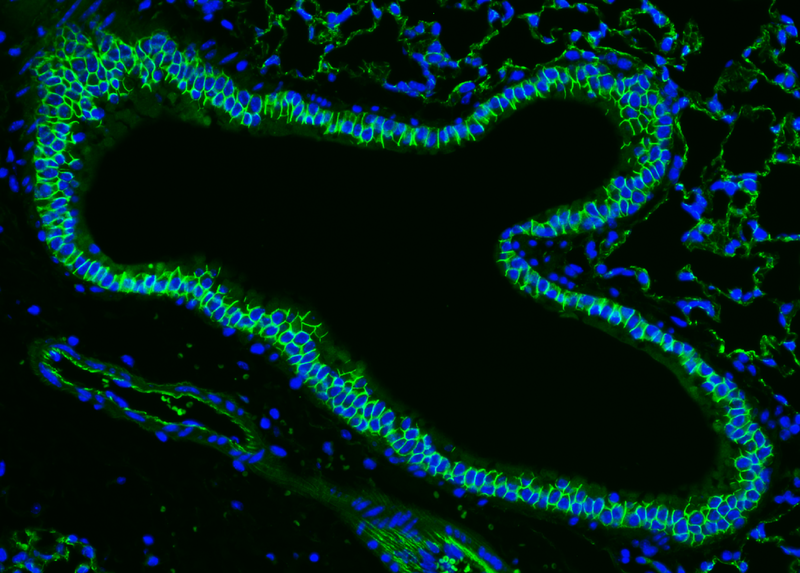 Cell structure (green) is labeled with an antibody to the cell-cell adhesion and transcriptional co-regulatory protein, β-catenin. Nuclei are labeled in blue. Scientists in the Division of Pulmonary and Critical Care Medicine have a huge responsibility on their shoulders: Diseases of the lungs represent some of the most common — and fatal — medical conditions in the world. Indeed, chronic obstructive pulmonary disease (COPD) is the third leading cause of death in the United States, and asthma affects more than 7 percent of adults and nearly 9 percent of children in the country. “The nearly 40 faculty in our division are tackling these problems head-on by combining exceptional clinical care for patients with cutting edge laboratory and clinical research,” said Scott Budinger, MD, the Ernest S. Bazley Professor of Airway Diseases, who was named chief of the division last spring after 16 years at Feinberg. In his own research, Budinger studies the lung on a molecular level to understand why age is the strongest risk factor for developing chronic lung disease. He’s principal investigator of a new project examining whether dysfunction in the lung’s proteostasis network causes age-related susceptibility to influenza A infection in mice. His lab will examine 25 different tissues every six months of the mouse lifespan to assess the protein-folding network’s functioning. They hope to extrapolate the findings to human physiology. Funded by the National Institute on Aging, the study is part of a multi-investigator program project focused on lung aging that includes faculty in Budinger’s division and beyond. Exploring areas spanning from muscle dysfunction to mitochondrial metabolism, the team includes Jacob Sznajder, MD, Navdeep Chandel, PhD, and Karen Ridge, PhD, all in Pulmonary and Critical Care Medicine; Harris Perlman, PhD, in Rheumatology; Richard Morimoto, PhD, at the Weinberg College of Arts and Sciences; and William Balch, PhD, at the Scripps Institute. Jing Liu, PhD, associate professor of Medicine in Pulmonary and Critical Care Medicine, is aiming to understand the molecular mechanisms underlying the regulation of inflammation. Her findings could provide therapeutic approaches for inflammatory diseases such as emphysema, chronic bronchitis and other types of COPD. Last year, Liu published research demonstrating that the protein kinase Jnk2 promotes mitophagy, a physiological process that removes damaged or excessive mitochondria from cells. By extension, Jnk2 helps maintain immune homeostasis and could protect organs from sepsis, the most common risk factor for acute lung injury. 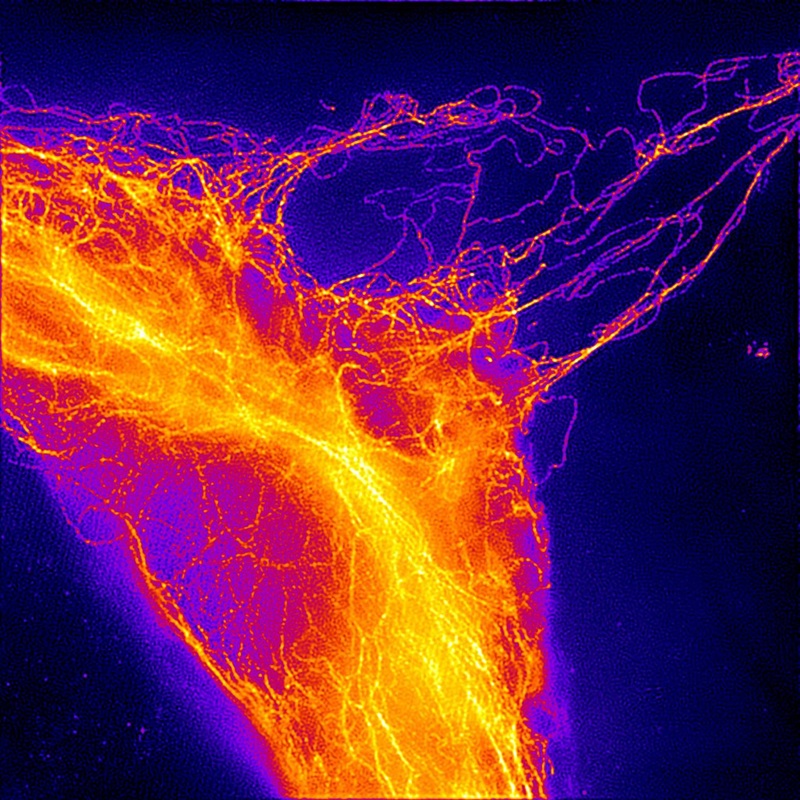 Vimentin intermediate filaments, cytoskeletal proteins studied in the lab of Karen Ridge, PhD, are visualized using a technique called structured illumination microscopy, which uses a shifting pattern of laser light to resolve features too small to be seen with an ordinary microscope. Karen Ridge, PhD, professor of Medicine in Pulmonary and Critical Care Medicine and of Cell and Molecular Biology, is also interested in the inflammatory response that leads to acute lung injury. She focuses on a protein called vimentin, which may activate that response. In 2015, she published a paper showing that vimentin deficiency consistently reduced the inflammatory response that leads to lung injury and pulmonary fibrosis in three different mouse models. “We are now examining the role of vimentin intermediate filaments in epithelial-to-mesenchymal transition, invasion and metastasis using a model of non-small cell lung carcinoma,” Ridge said. She will conduct this work with Vladmir Gelfand, PhD, Leslie B. Arey Professor of Cell, Molecular, and Anatomical Sciences, and Robert Goldman, PhD, chair of Cell and Molecular Biology, with funding from the H Foundation Multi-PI Basic Science Synergy Grant provided through the Robert H. Lurie Comprehensive Cancer Center. Broadly speaking, scientists know lung diseases can be caused by a myriad of circumstances: chronic lung disease from aging; COPD from smoking, air pollution and genetics; acute lung injury from inflammation triggered by pneumonia, sepsis and other pathologies; and asthma likely from a combination of genetic and environmental factors. But the molecular roots of these conditions are less clear and, often, more surprising. Cara Gottardi, PhD, associate professor of Medicine in Pulmonary and Critical Care Medicine, explores how perturbations in cell-to-cell adhesion contribute to diseases including asthma. A few years ago, her lab noticed that one component of the cell-cell “Velcro” they study, alpha T-catenin, appeared in multiple independent genome-wide association studies linked to asthma. Interestingly, the variant, aTcat, is only expressed in a few cell types: myoid cells of testis, cardiomyocytes of the heart and a subset of brain cells. Like so much of the research coming out of this division, Gottardi’s study has the potential to transform basic science discoveries into meaningful therapeutic options for patients.